Mayor of London Boris Johnson, like Churchill a journalist, historian, and rogue elephant of a Tory politician, has produced a wonderfully chatty book on Sir Winston Churchill. Not a cradle-to-grave biography, it’s instead an illuminating study of what it was that made Churchill different. Not just different from every other British politician or world statesman of the 20th century (and beyond), but the only man who could have saved democracy and its benefits for all peoples in 1940. And did. Johnson attacks his subject thematically, and with great dollops of humor. His chapters open with an evocative scene that introduces some revealing aspect of Churchill’s character. Johnson visits the graveyard of Winston’s nanny as a way of answering a question, “Was he a nice guy.” Yes, Johnson tells us unequivocally. And, in place of a beautiful, spendthrift mother who ignored her son and an erratically brilliant father who unaccountably denigrated the boy at every opportunity, it was the nanny, Johnson reckons, “who helped him to that vast and generous moral sense” that marked Churchill’s entire life. Churchill began his political career as a rogue Tory, a very junior back-bencher forever attacking his party’s leaders and positions. He jumped party at a personally opportune time to become a Liberal before bailing and swimming back to his suspicious Tory “friends.” He remained officially a Tory for his last decades in politics but was at heart, like his ancestor and hero John Churchill, first Duke of Marlborough, an above-party man. During Churchill’s Liberal years, as Johnson makes clear, the once and future conservative was, alongside ally David Lloyd George, the founder of the British welfare state. And this, Johnson makes clear, was the result of no politically ploy but of deeply held conviction. It was Churchill who gave the British working man unemployment insurance and an afternoon tea break (a benefit previously belonging only to the working man’s “betters”). His capacity for work rivalled Caesar’s and Napoleon’s, and certainly at a senior age neither imperator nor emperor attained. Churchill possessed, we are told, “phenomenal energy, a prodigious memory [he could recite entire poems where others could recall only a few famous lines], a keen analytic mind and a ruthless journalistic ability to sort his material so as to put the most important point first.” Add to this unbounded courage, whether displayed on the battlefields of Asia and Africa, across the rotting corpse-strewn no-man’s land of Flanders, behind the stick of very dodgy early aircraft, and the still fought-over Rhine crossings into Nazi Germany. He had to be virtually, if politely, ordered by his king not to join the Allied flotilla on D-Day. Johnson acknowledges Churchill’s role in establishing the Middle East that is the mess it is today, but he places most of the blame on its residents, who never did get along in the way Churchill thought they would. He credits Sir Winston with contributing mightily, through the Atlantic alliance and the containment of war through summits, to the ultimate Western victory over the Soviets in the Cold War. But it is the Second World War that Johnson repeatedly redirects our attention to, and deservedly so. Johnson pinpoints the moment when Churchill’s courage put his Cabinet colleagues, and eventually the world, on notice that there would be no negotiation with Hitler, no talks that would have melted a nation’s resolve. The “icy ruthlessness” of destroying without warning the fleet of his French ally further and violently displayed his determination to the world, and especially an America reluctant to go to war. Among allies, neither Roosevelt nor Truman, nor a parsimonious U.S. Congress hell-bent on bleeding Britain, comes off well in Johnson’s book in comparison to the large-hearted Churchill. 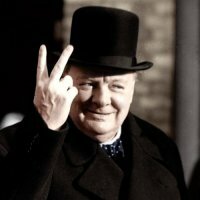 Whatever his flaws, Churchill applied his full energy, intelligence, wit, courage, and command of the English language to the most important task any leader has ever had, in preventing the “irredeemable disaster” of the surrender of Britain and the darkness that would have descended over all of Europe. Johnson does not know whether the Gestapo or KGB would have policed the continent in the end. He has no doubt that, without Churchill’s defiance, isolationist America would have steered clear, content to do no more than fight the Japanese. Would the U.S. have remained a democracy, in the face of the clear superiority of totalitarianism? Johnson is skeptical. For British readers, the book is an argument why Boris Johnson should be Prime Minister. For Americans readers, it’s perfect whether you wish to better understand the iconic, cigar-chomping English bulldog wearing the odd, high-topped bowler and sporting the up-Hitler’s “V for victory” sign or simply to spend several hours in a comfy chair with a breezy read in one hand and a swirling glass of brandy in the other.